Cajun tilapia with mango salsa. QEII Taste by Leith’s, the in-house QEII Centre caterers, has launched new seasonal menus available from April 2017. These also reflect changes in dining habits, now including a creative bowl food selection for flexible catering, a refined fine-dining menu selection as well as increased vegetarian, vegan, healthy and gluten-free choices. New head chef, Jean-Michel Viala joined QEII Taste at the end of last year from The Dorchester, where he was Head Chef of Banqueting. His arrival coincided with the QEII Centre celebrating its 30th anniversary, as well as a £12m refurbishment and re-brand. Jean-Michel has now unveiled new menus for 2017 which reflect Leith’s commitment to innovative, fresh, uncomplicated food, prepared using fantastic ingredients. 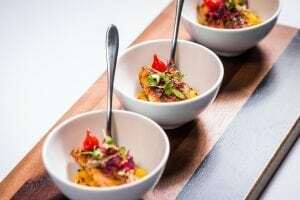 The new bowl food menu has been designed to offer a flexible dining option for event planners. These include British classics such as braised shin of Gloucestershire beef or more contemporary dishes such as pan-fried Cajun spiced tilapia, mango & coriander salsa. These are in addition to the updated breakfast, canapé, buffet and sandwich selections – which now all include more vegetarian items and increased healthy choices, for those looking for lighter options (for example, home-baked cakes and savoury snacks are now offered as an alternative to biscuits during breaks). Furthermore, all of the menus can be produced totally gluten-free. Jean-Michel has also drawn on his extensive Banqueting experience to offer a range of fine dining menus which suit the grandeur of the newly refurbished Mountbatten suite. The event space features a lobby with breathtaking views of the Big Ben, the London Eye and Westminster Abbey.